Fleurier is a town in Val de Traverse area in the Canton of Neuchatel in Switzerland. But from this tiny village...more or less, population of 3500 has produced no less than 2 Nobel Laurettes: Charles Guillaume and Daniel Bovet. And boasts of three interesting watch manufactures: Parmigiani Fleurier, Chopard and the independent Kari Voutilainen. Cold, harsh winters are the norm here, and when I visited in late November 2011, it was not yet winter, but the weather was already quite cold on some days. 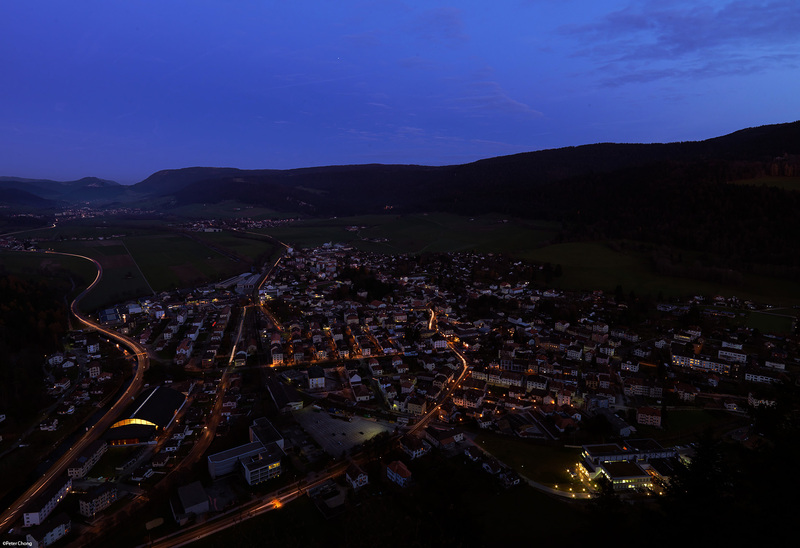 Though, I managed to find some sunlight to make this pre-dusk panorama of the entire Fleurier. And from the vantage point of Chapeau de Napolean...Napolean's cap(200m above Fleurier)...captured just after dusk.